It would be invidious to pick out one snowdrop from the two gardens in Dublin visited by the Ulster Group of the Alpine Garden Society on 10th February2018. However one that did take my eye was Galanthus “Madeleine”. There were at least two large clumps of this flavescent (yellow) snowdrop close together, indicating that it had probably been vigorous enough to split (picture below). Luckily David Ledsham was on hand. He also has G. “Madeleine” in his garden and he confirmed it was a good “doer”. 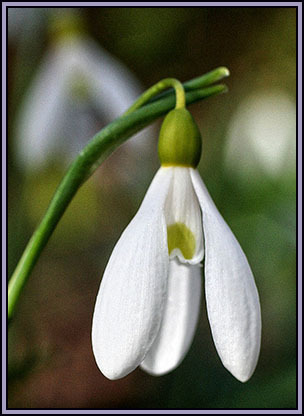 Flavescence in snowdrops has been known since at least 1877 when Rev. H. Harpur- Crewe was asked to identify a G. nivalis for a Mr. Sanders. The plants in question had been collected in Northumberland. Rev. Harpur-Crewe named them after Sanders G. sandersii. There were many subsequent collections in the years to come – all from Vice County 68 (Cheviot). As they come from a variable wild population they are now correctly given a group name – G. nivalis Sandersii Group. The population in Cheviot has been studied by Beeston and Pitts, undergraduates of Dr. John Richards at University of Newcastle. They concluded that it was genetically controlled (rather than a virus). This gene however is also recessive. Seed-set in G. nivalis is low as plants are self-incompatible. So yellow snowdrops are rare and as such have been highly desirable to collectors. Another aspect of the wild population in Cheviot noted by Beeston was a lack of vigour, with yellow plants occurring at the fringes of their sturdier neighbours. Flavescence probably occurs in all Galanthus species. Over the years I have had several (all cultivars of G. nivalis and G. plicatus). Only G. plicatus “Wendy’s Gold” and one of the Sandersii Group have survived in my garden. I am sure this is probably down to my own (lack of) skill as a cultivator. It is not unusual however to see yellow snowdrops given extra attention in even famous gardens. One solution is to grow them in sinks. A lot of cultivars definitely lack vigour. A vigorous yellow snowdrop would be a welcome addition to any collection. 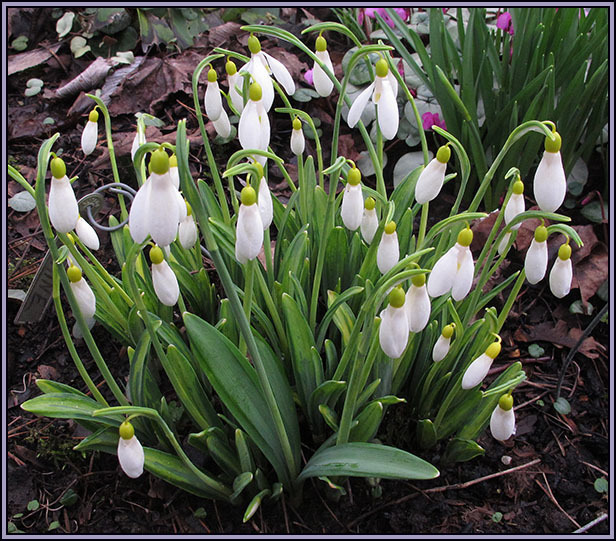 Galanthus “Madeleine” was found as a chance seedling at Monksilver – the nursery of Joe Sharman, and named for his niece. It is a vigorous mid-season snowdrop with green leaves. The intensity of the yellow varies according to soil type. As a footnote the most expensive snowdrop I have heard of is also yellow and came from Joe Sharman's nursery. 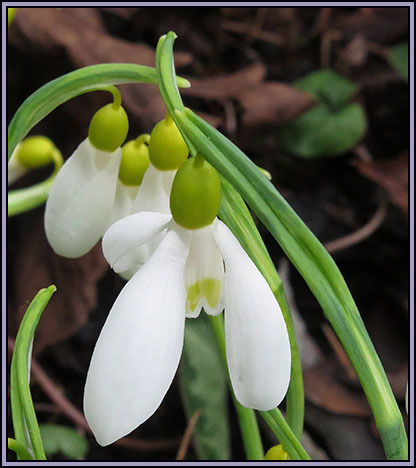 Nearly all Galanthus cultivars have arisen by chance. This is in marked contrast to, for instance, Narcissus cultivars. In our own AGS Group Brian Duncan is an exemplar daffodil breeder, deliberately crossing plants and only naming the very best. G. “Golden Fleece” is a cross between “Wendy’s Gold” and “Trym” (both plicatus cultivars). When back-crossed to “Wendy’s Gold” the recessive gene is given expression and the result is a new yellow snowdrop. However it probably took a decade to produce “Golden Fleece”. There are also far more yellow snowdrops than I ever imagined, I suppose as galanthophilia has spread to the Continent. A recent stream http://www.srgc.net/forum/index.php?topic=15063.0 on the Scottish Rock Garden Club website named about 140, which truly staggered me. So the future of yellow snowdrops seems assured as we no longer have to rely on chance finds. They will remain however highly desirable and you will require a deep pocket and eBay to fulfil your desires. I would like to thank David Ledsham for all his help and comments, and for the photographs taken in his garden.